An exceptional value for a HardBodyz reel withadvanced DigiGear digital gearing—you can feel the quality with every turn of the handle. The diecast aluminum alloy body and machined-aluminum ABS spool keep the weight down, while thesmooth 7-bearing system includes 2 CRBB (Corrosion-Resistant Ball Bearings) in key locations for added reliability. Roller bearing-supported Infinite Anti-Reverse; Gyro Spin balancing; and Twist Buster line twist reduction. FREE aluminum spare spool. "I have had bad luck in the past with Daiwa spinning reels but after testing one out at the store, decided to take a gamble. I got the 2500 size and mounted it on a 6'9" Kistler spinning rod for finesse plastics." "Wow, this reel really blew me away. I was just browsing the reel displays and playing with reels as I was just chatting with the guy behind the counter. I came across this one, without even hardly noticing what reel it was." 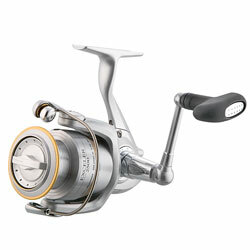 "This reel was recommended to me by a BP staff member who could only explain it as a "diamond in the rough". After using it all season I can see why. This reel is incredible! The price point (and lets hope BP doesn't catch on) is wayyyyy below what it should be for this kind of quality. " "This reel is WELL worth the money, I was using another brand of reel and my wife bought me this one...I tried it and love it, very smooth and after a year of hard fishing it still performs flawless...I will be buying another one"